ORLANDO, Fla. - Tiger Woods will get a careless driving citation for a car crash outside his Orlando-area mansion last week, but will not face criminal charges, the Florida Highway Patrol said Tuesday. Woods faces a $164 fine and four points against his driver's license. The citation will close the investigation. "Despite the celebrity status of Mr. Woods, the Florida Highway Patrol has completed its investigation in the same professional manner it strives to complete each traffic investigation," Sgt. Kim Montes said. According to a patrol accident report, Woods crashed his SUV into a fire hydrant and a tree at 2:25 a.m. Friday. 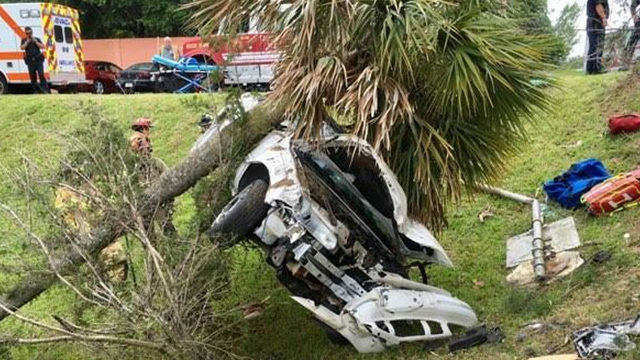 The airbags did not deploy and Woods' wife told Windermere police she used a golf club to smash the back windows to help him out. The patrol "is not pursuing criminal charges in this matter nor is there any testimony or other evidence to support any additional charges of any kind other than the charge of careless driving," Sgt. Kim Montes said. An attorney for the neighbors who dialed 911 after the crash said Woods did not appear to be driving under the influence and showed no signs of having been in a fight. The Florida Highway Patrol said there were no claims of domestic violence and no reason to issue a subpoena for medical evidence. Woods' injuries were "consistent with a car wreck and inconsistent with him being beat up," said Bill Sharpe, the attorney for the neighbors. "The scratches on his face were consistent with someone who maybe was in a minor car accident and hit his head on the windshield. ... None of his injuries looked like he was beat up by his wife." In its initial accident report, the Florida Highway Patrol said alcohol was not involved. Sharpe said neighbor Linda Adams and her two adult sons went outside their home in the exclusive gated community of Isleworth after hearing the crash and Woods' wife, Elin Nordegren, asked them to call the 911 emergency number. He said the neighbors found Nordegren kneeling beside her husband, upset about his injuries. Sharpe said Woods appeared woozy and had scratches on his face and that his wife was trying to console him. The Adamses wrapped Woods in a blanket and made sure he didn't move. On the 911 call, a man told an operator, "I have a neighbor, he hit the tree. And we came out here just to see what was going on. I see him and he's laying down." The caller did not identify the neighbor as Woods, and when asked if the victim was unconscious, the neighbor replied, "Yes." "I need an ambulance immediately. I have someone down in front of my house," the caller said. "Are you able to tell if he's breathing?" the operator asked. "No, I can't tell," the caller said. "One thing we want to make clear is that Mrs. Woods' attitude was consistent with her being concerned about her injured husband," Sharpe said. "Mrs. Woods was trying to help him. Mrs. Woods was worried about her husband. She was concerned." Sharpe said the Adams family did not see the crash and did not see Woods' wife with a golf club. He said he was hired to get the message out that the Adams family members have told investigators everything they know about the crash and aren't hiding anything. The situation does not appear to be affecting Woods -- at least in connection with his sponsors. Nike released a statement saying, "Tiger and his family have Nike's full support. We respect Tiger's request for privacy and our thoughts are with Tiger and his family at this time." Gatorade also issued a similar statement, and although Gillette did not issue a statement, the company said it is not planning any changes to its marketing campaign featuring Woods. Meanwhile, betting Web sites are taking odds on Woods' future. Bookmaker.com is listing odds on numerous bets, including whether Woods will stay with his wife, Elin. There are also odds on if Woods would admit if he's having an affair and whether he was driving under the influence of alcohol. Copyright 2011 by ClickOrlando.com. The Associated Press contributed to this report. All rights reserved. This material may not be published, broadcast, rewritten or redistributed.